Freeport and Old Orchard Beach are among high school programs who will join the developmental league this fall. Three high school football teams will join the Class E developmental league this fall in what could be a precursor of even bigger changes to Maine’s gridiron landscape. Old Orchard Beach, Freeport and Dirigo will play in Class E in 2018, forming a nine-team league with the six holdovers from the inaugural season – Boothbay, Camden Hills, Maranacook, Sacopee Valley, Telstar and Traip Academy. Freeport, a Class C program last season, intends to be in Class E for only one season. Old Orchard Beach and Dirigo both were in Class D last year. A new two-year classification cycle begins in the fall of 2019. Much still needs to be discussed, debated and ultimately decided, but it is apparent that the groundbreaking idea of eight-man football for the state’s smaller schools will be seriously considered for the first time. With overall school enrollment declining across the state, many football programs have grappled with dwindling rosters. Class E was created before the 2017 season to provide an option for struggling programs, including four schools (Boothbay, Camden Hills, Sacopee and Telstar) returning to varsity competition after dropping their programs. Class E teams do not play for an official MPA championship, but the league held a four-team playoff last fall. Heal Point standings are kept, and there is the possibility of crossover games with teams from other classes. Plante said he’ll wait until after reclassification is finished before he worries about where the Seagulls will play in 2019. “We’ll see what the MPA considers. There’s a lot of possibilities, (including) strong consideration of eight-man football (and) basing classification on more than just enrollment,” Plante said. “There’s a lot of work to be done before now and the next schedule. Freeport is not a likely candidate for a long-term stay in Class E or an eight-man format. But the Falcons project to have only 28 players in 2018, with 21 being freshmen or sophomores. The numbers are better at the middle school level, where Freeport expects to have 16 eighth-graders, 18 seventh-graders, 15 sixth-graders and 12 fifth-graders playing this fall. Last season, Old Orchard Beach and Dirigo had 3-5 records in Class D South, with Dirigo qualifying for the playoffs. The teams faced increased competition in Class D after several traditionally strong programs moved down from Class C – notably Wells, Madison/Carrabec and Mountain Valley. “Now, we’ll have a lot of teams that we had competed against regularly – the Boothbays, the Traips, the Dirigos – so it’s not a huge scheduling change,” Plante said. 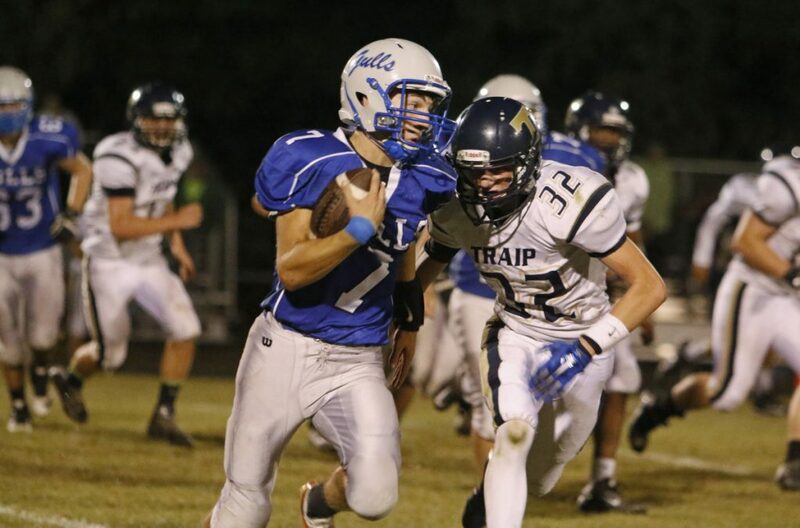 Traip forfeited six games last season, including its last five, because it did not have enough healthy players. The Rangers’ “intent is to play a full Class E schedule this year,” said Athletic Director Mike Roberge. Ed McDonough, who coached Traip in 2017, will not to return, Roberge said. Candidates have been interviewed and a new coach is expected to be named in early April.